This stunning pool melts effortlessly into the Kandalama Lake. As you relax in his heavenly location, a local flautist will gently play soothing music as all your worries evaporate into the calm, evening skies. There are other pools at this resort and an extra-large one for water sports and daytime fun but as the sunsets, there is only one pool that you’ll want to slide into. The Greek island of Santorini offers some stunning hotels all with fabulous pools to boast about but the Grace has beautiful views over the Mediterranean Sea with an infinity pool on the terrace. You can lose yourself in the magnificent panoramic vistas while having a cocktail made for you. This exclusive boutique style hotel also boasts an award-winning restaurant, complimentary yoga and a private spa. Sounds like heaven! This could possibly be the most magical of all. 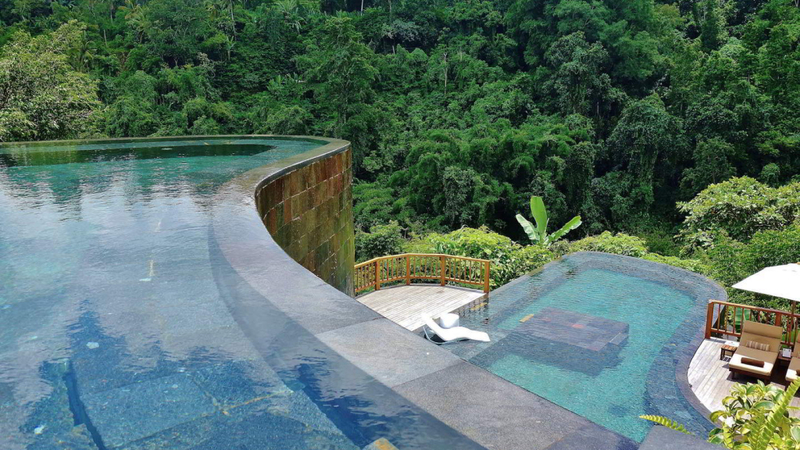 Located high above the Ayung River, this infinity pool literally seems to drop into the jungle below. 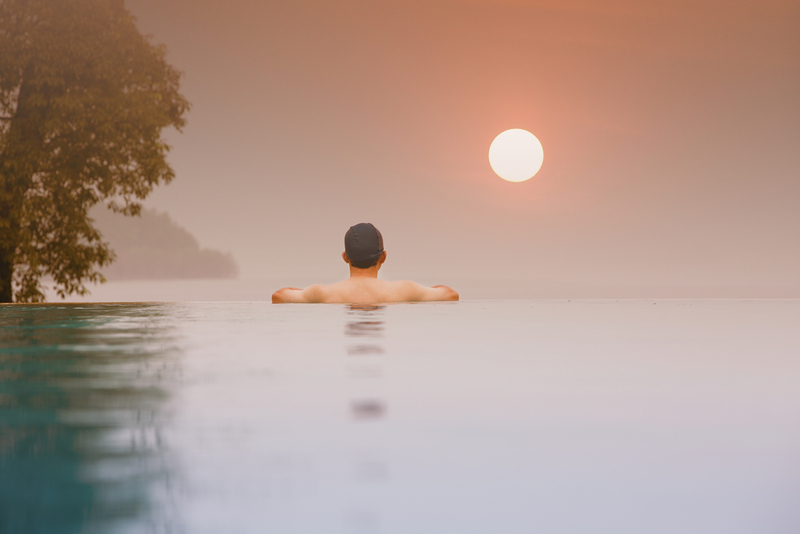 Bali has been described as the birthplace of the infinity pool and they definitely do them well here. This pool shows the others how it’s done! Every single room at this resort has its very own private infinity pool but the main pool features two levels, jutting out over the rainforest canopy in dramatic fashion. This is one pool you must swim in at least once in a lifetime. Another delightful hotel where all rooms have their own pool with adjustable fiber optic lighting for setting the mood. The main infinity pool is situated at the top of the mountain, decorated with tiles that catch the light and glitter in the sun. 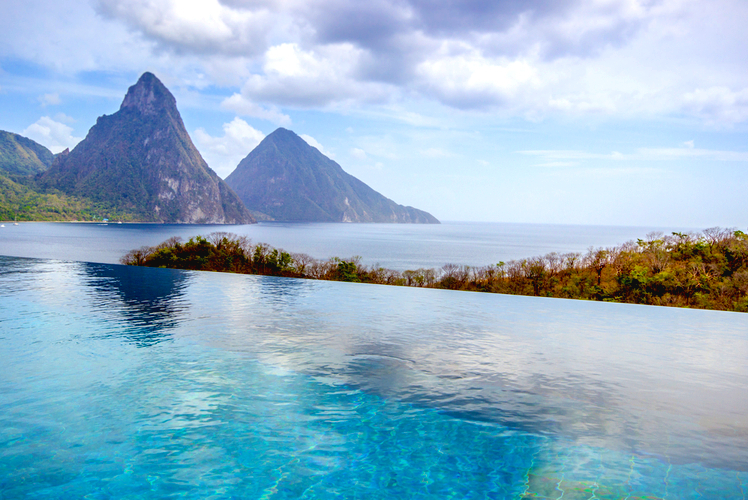 The views on offer are simply breath-taking over the Piton mountain range and to the ocean. You’ll never want to get out. 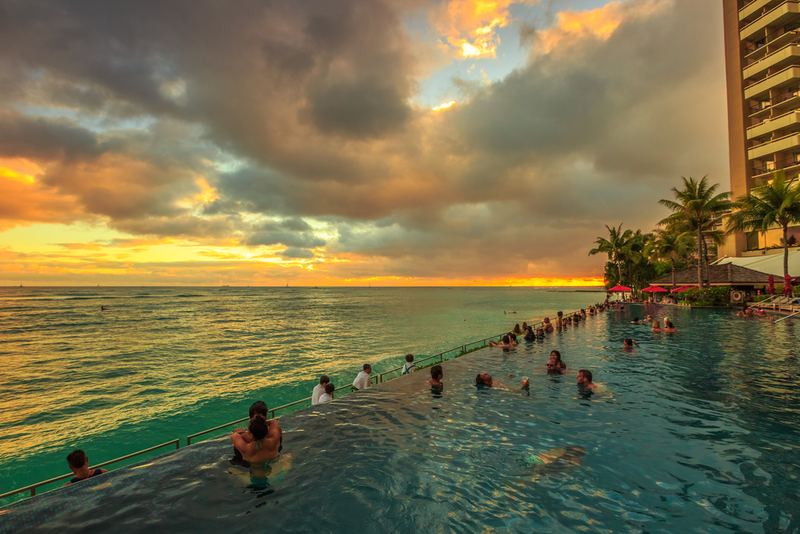 Located on the iconic Waikiki Beach, the Sheraton offers you ‘Edge of Waikiki’, an endlessly stretching pool that seems to travel all the way to the horizon. The views of the beach are stunning and the pool is only a few feet higher than the ocean level which creates an awesome mirage effect. For younger guests, the hotel also offers two pools with play fountains, slides and whirl pools. If you’ve got a good head for heights then you’ll enjoy this spectacular view out across the ocean. 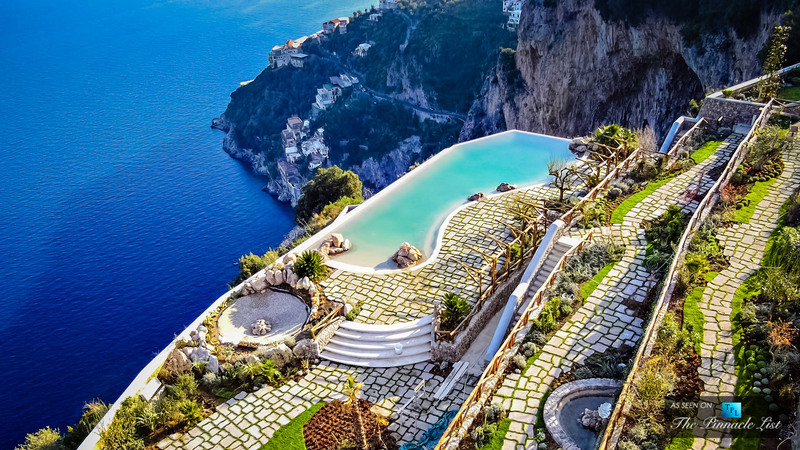 This 17th century hotel is perched on a cliff in the beautiful Amalfi Coast region of Italy and offers a luxury spa and elegant Mediterranean dining. The seemingly vanishing edge of the pool is wonderfully dramatic as this fresh water pool appears to blend magically into the sea below it. If you have the energy to climb further up the cliff, you can look down on the hotel and pool, which provides an even more awe-inspiring vista. The contrast of blues between the ocean and the pool are beautifully dramatic here as the one appears to meet the other. 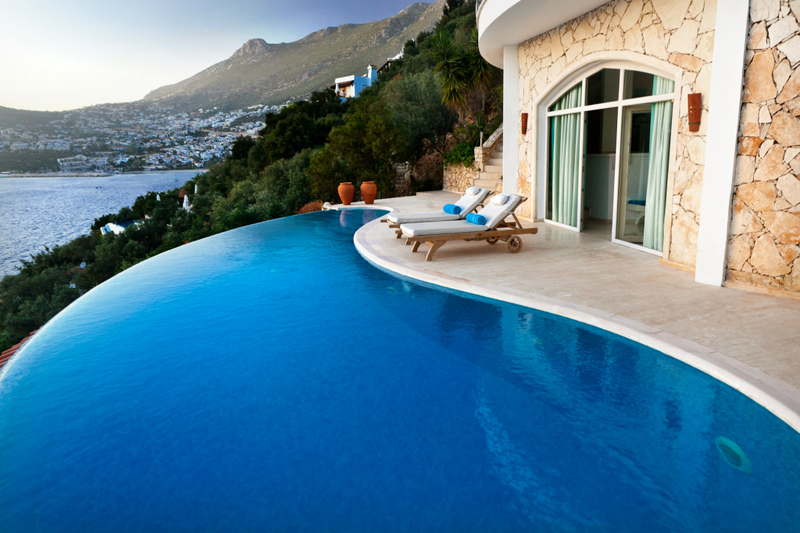 The 55-foot long infinity pool also comes with a jacuzzi for even more luxurious relaxation as you gaze out over Kalkan Bay. This region has grown in popularity recently due to its fantastic beaches and numerous sights of historical importance, including the ancient capital of Lycia. It’s a very romantic hotel with panoramic roof terrace dining, waterside dining and massages in a cool, natural cave! 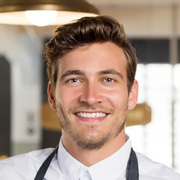 With a name like this, it just sounds like you’re going to have fun. 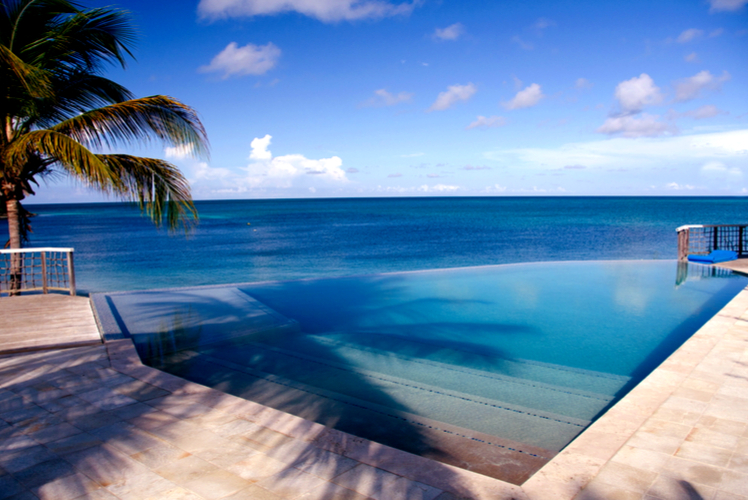 As well as having access to a whopping 82-foot veranda pool, you’ll also discover an infinity pool with ocean views right at the end of Jumby Beach. The only things on your to-do list whilst staying here are soak up the sunshine and views while choosing something fresh and delicious from the Pool Grille.